Above: The Roman lighthouse, Torre de Hercules. 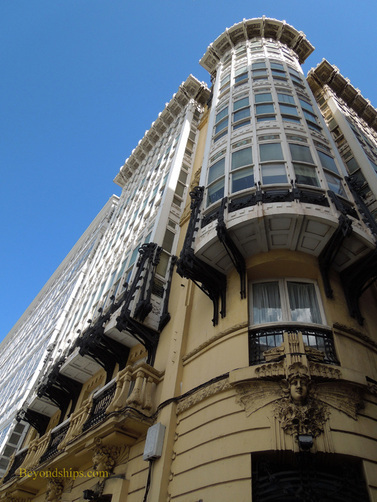 Above: The Gallerias on Aviendo de la Marina. Below: La Coruna's City Hall. La Coruna is not high on many people's bucket list. 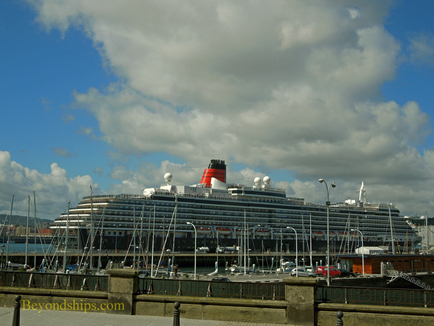 Nonetheless, it is a pleasant stopping off point on cruises from Britain to the Mediterranean and other points south. Located at the very northwest tip of the Iberian Peninsula in the autonomous region of Galicia, La Coruna is unlike the rest of Spain. Cut off from the rest of Spain and Portugal by mountains, the often wet climate is more akin to Britain than to sunny Spain. Clouds can roll in off the Atlantic and produce a sudden shower. “Dolts Drench” is what the locals call the drizzle. However, at the same time, the rain makes the area the greenest in Spain. When the sun appears, the deep color contrast is quite appealing. The people too are different. They are of mostly Celtic origin. Consequently, bagpipes and dances that resemble Scottish reels are part of the Gallacian culture. Other peoples have come to La Coruna and left their mark. 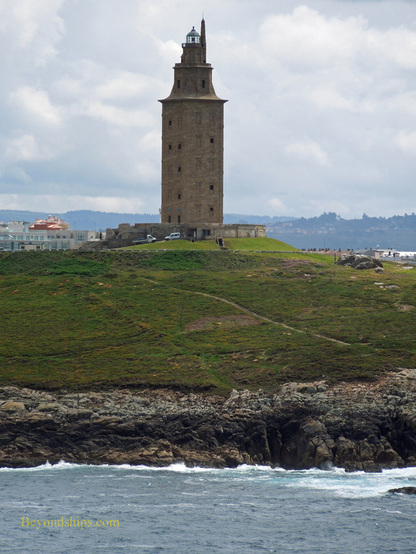 The 431-foot Torre de Hercules is a lighthouse, which according to legend was one of the labors of Hercules. It was actually built by the Romans during the reign of the Emperor Trajan in the Second Century A.D. The outer skin dates from 1791 but the interior remains Roman. 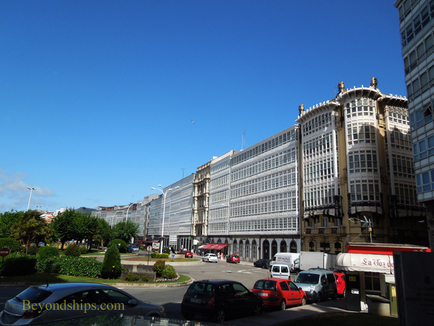 Updated over the centuries, it is still in operation today and is one of La Coruna's most prominent attractions. It stands on the coast some ten minutes by car from the town center. The biggest attraction in the area is Santiago de Compostela. Located some 40 miles away from La Coruna, the cathedral houses the tomb of St. James, one of the Apostles. Consequently, it has been a popular pilgrimage destination since medieval times. But one does not have to leave La Coruna itself to find something interesting to do. Cruise ships arriving in the port usually dock in the heart of the town. As a result, the majority of the town's attractions are within walking distance. However, be aware that there are some uneven surfaces, particularly in the old town (Ciudad Vieja or the Groyne). The galleria that you see on Aviendo de la Marina are actually at the back of the buildings. 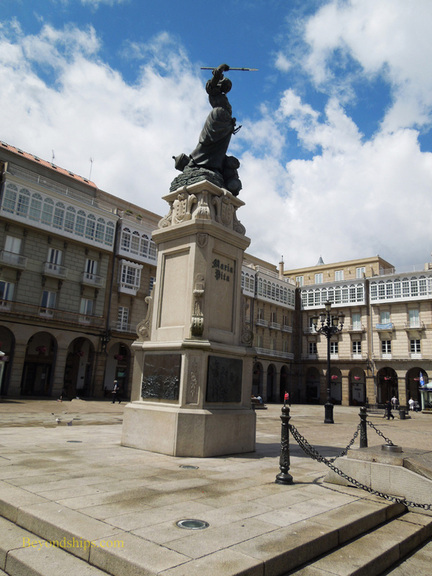 On the front side, the buildings face La Coruna's large main square. 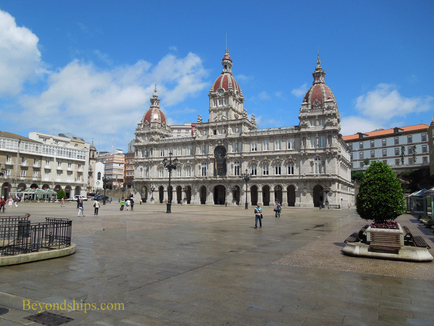 There you will find La Coruna's impressive city hall (Ayuntamiento), built in the early 20th Century. You will also find the statue of Maria Pita, for whom the square is named. Maria Pita was a local woman who won fame when La Coruna was besieged by the English under Sir Francis Drake in 1589. La Coruna had been used as a staging area by the Spanish Armada in its ill-fated attempt to invade England in 1588. After the Armada failed, Drake, often referred to as “Drake the Pirate” by locals, came to La Coruna to make sure that it was never used for such a purpose again. During the siege, Maria Pita broke through the English lines and killed the English standard bearer. Seeing their banner fall, the English fell into a state of confusion. The Spanish were inspired by the same sight and attacked. Consequently, Drake's attempt to capture La Coruna failed.